Shop Luggage Online at LuggageOnline.com as your source for premier quality luggage, laptop & briefcases, backpacks, handbags & accessories, duffel bags and travel accessories. Luggage Online carries the leading brand names in the industry including Tumi, Sumdex, Delsey, Travelpro, Liz Claiborne, Samsonite, Kipling, Goodhope, Travelers Choice, Victorinox Swiss Army, Hartmann, Boyt, Atlantic, Vanguard, Travelon, A.SAKS, Sally Spicer, High Sierra, Moonsus, Tony Perotti and much more, offering the savings and selection you're looking for. Visit 58Coupons for the best LuggageOnline deals, LuggageOnline coupons, LuggageOnline promotions and LuggageOnline free shipping offers for LuggageOnline.com. Save up to 75% on brand name luggage at LuggageOnline.com. Click link to travel in style for less. Get Free Shipping on orders over $99 or more at LuggageOnline.com. Excludes Tumi products. Click link. Enjoy $10 off your order of $50 or more with this coupon code from Luggage Online. Some restrictions apply, click link for details. Find Delsey luggage for up to 70% off at the Closeout sale going on now at LuggageOnline.com. 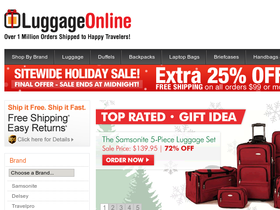 Enjoy closeout savings of up to 67% on select styles of Samsonite luggage when you shop at LuggageOnline.com.